Alpha-Beta is a simple arcade game in which your goal is to collect all alphabets of the dictionary. You defeat the terrifying enemies in this game and rescue the alphabets. At the beginning, you play as an attacker. You can upgrade him with coins and unlock more characters like Devil, Fire, Ice, Stun, Missile, Tank Wizard, King, Power Up, Queen, and more with coins. What you have to do? How to play? You have to rescue all alphabets locked in jail. You navigate your characters where you want to move. Just follow the arrow[dialogue box showing the distance between you and jail]. You have to find it or follow the navigation arrow. 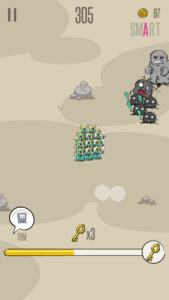 You will lose your army if you get in touch with waves of enemies. So, to rescue or get more helpers you need to unlock jail. To unlock jail, you need keys. To get keys, you have to slay down enemies. You will get coins by slaying down enemies and use these coins to upgrade character or unlock more characters. The first thing you have to do is increase the numbers of attackers. Initially, you have only one key. Increase attackers⇒slay down enemies⇒increase coins and keys⇒compete with your friends for the higher score. It’s simple. 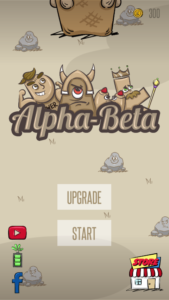 Alpha-Beta is a simple, addictive, and challenging game. If you’re looking for a light size games then you should check these posts too – Best Android games under 10 MB, Best Android games under 20 MB. Next Post:Destiny6 Is In Soft Launch? But You Can Play It! !